Stronger Economy – Blue States Or Red States? Conventional wisdom says that conservative states are more business friendly than liberal states. Quite often, conservatives will crow about red states having lower unemployment, more economic growth, etc. while implying that blue states are full of lazy, socialist slackers. 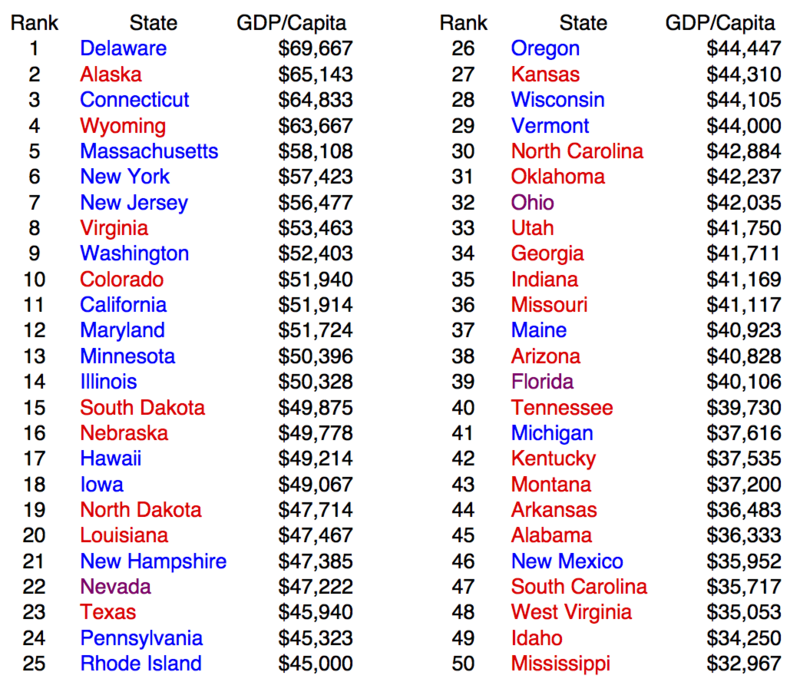 Let’s compare two of the biggest factors that determine wealth and prosperity – GDP per capita and unemployment rate – to see if there is a difference between red and blue states. The first task is defining which states are red or blue. The following graphic shows how states voted in the last four presidential elections. Dark blue or red represents states that voted democrat or republican in all four elections. 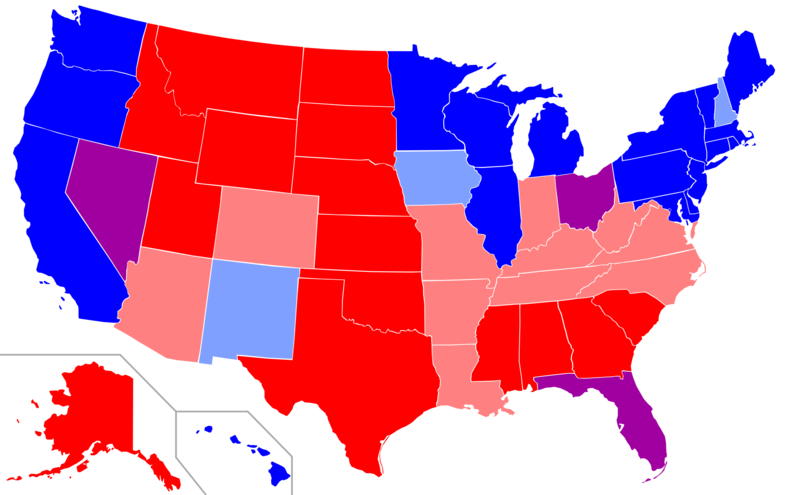 Light blue or red represents states that voted democrat or republican in 3 out of the 4 elections, and purple states voted twice for each party. Now let’s look at the latest unemployment figures by state. 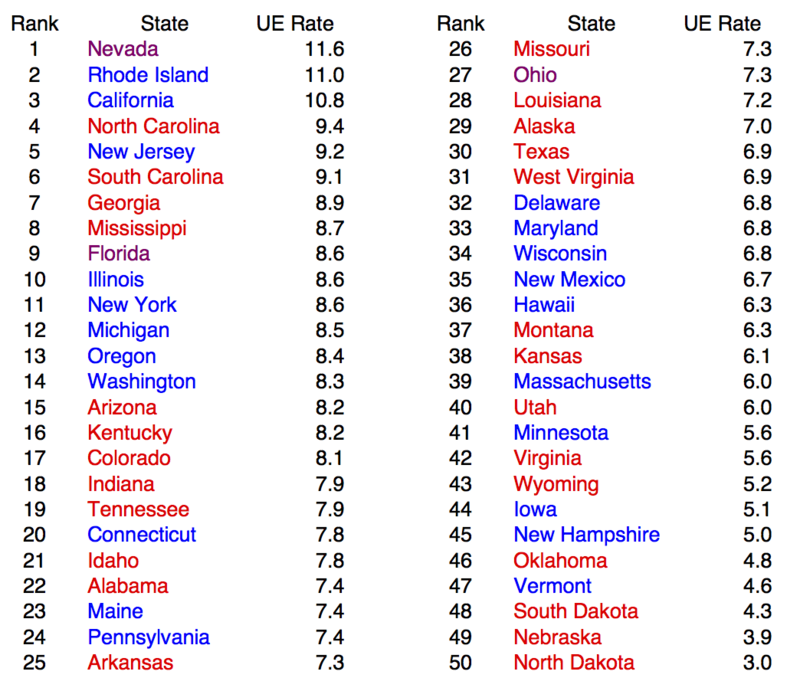 When you look at the 25 states with the highest unemployment rate, there are 12 red states, 11 blue states and 2 purple. In the 25 states with the lowest unemployment rate, there are 14 red, 10 blue and 1 purple. There are slightly more red than blue in each group, but there is a slight advantage among the red states. Now lets look to see which states are wealthier and more productive. In the wealthiest 25 states, there are 15 blue, 9 red and 1 purple. In the poorest 25, there are 17 red, 6 blue and 2 purple. When it comes to wealth creation, there is a significant advantage in the blue states. In conclusion, if you want a slightly better chance at landing a lower paying job, move to a red state. If you want a better chance at becoming wealthy, move to a blue state.